Features superb recovery position precision. Perfect for attaching tables or indexers. Type 2: Can be attached directly to timing pulleys. Shaft fastening screws can be tightened from the outside. Type 3: Thinner than the type 2 version, perfect for attaching to power locks. 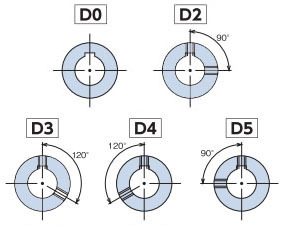 Precise attachment face: A pre-load is applied to the support bearings to eliminate gaps, and along with the attachment faces being ground results in increased precision. High precision: Features minimal backlash and high precision return positioning. Perfect for indexers. Simple torque adjustment: Features a torque scale -- just turn the adjustment nut (bolt) to freely adjust the trip torque.